In January 2017, the British Council India, in association with the Central Square Foundation launched a publication featuring a collection of case studies highlighting the innovative ways in which educators, schools and organizations across the country are using technology to improve student learning and teacher development. Whether it’s the use of Quick Response (QR) codes in textbooks to provide additional links to online materials as a means to extend the curriculum, or computer-based training for teachers’ professional development, there is no end to the application of technology for the enhancement of education and learning in the 21st century. The publication points to the widespread use of technology to make classes more interactive and engaging, promote autonomy of learners through the use of computers and tablets, to improve the quality of training provided to teachers, and to generally make education more accessible through the use of tools such as video conferencing and the increasingly popular Massive Open Online Courses (MOOCs). One particularly intriguing change enabled by the proliferation of technology is the use of mobile and web-based applications by various kinds of schools across the country. 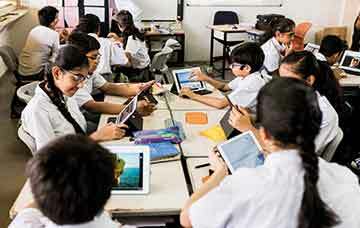 Whether it’s the low-cost Aakash tablet or the latest iPad, mobile devices are changing the way students are learning. “Technology enables complete personalization of the learning experience to suit the needs, passions and interests of an individual child,” says Gorsi Parekh, Founder of Ahmedabad International School. “This fosters a love of learning and allows children to discover their natural bents, ensuring that no matter what the world of tomorrow might require them to learn, they will approach it with a healthy attitude,” she adds. Ahmedabad International School recently adopted an intensive technology integration program aimed at promoting self-driven, teacher-guided learning that can nurture children’s innate creativity and talents. Students and teachers use iPads to collaborate on an application called Cerebro, a custom built platform that allows for developing personalized learning plans for each student. A given learning plan can consist of a range of activities, from watching specific videos and reading assigned material to conducting prescribed hands-on exercises or experiments. The application tracks each student’s progress and hence offers valuable insights into their strengths and aptitudes. Cerebro also features an intelligent content bank that allows both students and teachers to access world-class content in different subject areas from a variety of sources such as Khan Academy, ASAP Science, Scratch, Code.org, etc. At the same time, the parent end of the application provides an in-depth holistic view of the child’s learning and progress. Another major challenge comes in the form of rigid government guidelines and rules for curriculum, administration and assessment that limit the flexibility of schools to truly innovate. It is clear that merely bringing broadband, tablets and educational apps into schools will not automatically change traditional teaching and school administration methods. Perhaps it is these limitations that have fuelled the rise of Ed-tech start-ups and non-governmental organizations working toward reinventing education in India and other developing nations. For instance, the New Delhi-based MarkSharks seeks to encourage more constructivist pedagogies in the classroom through apps aimed to support the teaching of science and math in grades 8 to 10. Available in a number of languages on Android tablets and phones, MarkSharks apps consist of both information about a topic and interactive elements that children can engage with. On the other hand, Guru-G Learning Labs in Bangalore works on apps that are not directly aimed at children but rather designed to develop teachers and support them in teaching math, science and social science. 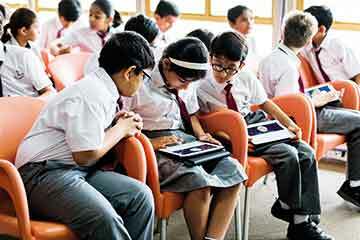 These apps are used in over 400 government and private schools in the Karnataka region. The Mumbai-based Intellinects Ventures is another company working to leverage technology for improving the overall effectiveness of education. “We are neither educationists nor teachers but rather we are looking at how technology can be used in classrooms to capture information that can help students, teachers and parents make better decisions,” says Kevin Saldanha, Director of Intellinects Ventures. Having partnered with over 75 schools and colleges across the country, Intellinects provides both web and mobile applications offering a range of functionalities. “Our mobile app serves as a communication platform between the school and parents, providing digitized messages, circulars, students’ homework assignments, attendance record and report card,” shares Saldanha. “Other support features are continuously added such as a bus tracking service, a library management system where you get to view the reading habits of the child and a learning management system for storage and access of content such as previous years question papers and presentations delivered by teachers in class,” he adds. Further, a ‘student profile’ feature allows teachers to make notes about various facets of the child’s development such as sporting abilities, special talents, any behavioural issues, etc. This information is then easily available to a new teacher when the child moves to the next grade. “Our entire education system is skewed toward academics which means that at the end of 10 years of schooling, career choices are made on the basis of just a snapshot of a child’s academic record, while largely ignoring his/her other talents and aptitudes. At Intellinects, we are trying to provide a means of gathering holistic information about every child so that a truly informed decision can be made when making decisions for the future,” explains Saldanha. Needless to say, the adoption and effective integration of technology within any school system is never a straight-forward or quick process. “We typically help schools through a two to three year process of transition,” says Saldanha. “Our aim is not to close a sales deal but rather to move the institute along in the adoption of technology, addressing the unique challenges it is faced with. Our expertise lies in understanding processes and working out how to make change happen in the best way possible,” he says. At Ahmedabad International School, in-depth research was carried out before undertaking the ongoing technology integration program. Interviews were conducted with young Indian parents from Delhi, Ahmedabad, Mumbai, and Bangalore to investigate what they expect of the school system. The most common recurring theme among all the parents was that schools should help children become future-ready and equipped for success. In the rapidly changing world we inhabit, this essentially means that the material purpose of a school is to prepare students for jobs that don’t currently exist; jobs which will require them to solve yet unknown problems using technologies that have not been invented yet. “To equip children with the skills required to succeed beyond school, we need to create opportunities for collaborative problem solving, real-world application of concepts, and trans-disciplinary learning that can help them form connections between different subject areas,” says Gorsi Parekh. “Technology plays an important role in making all of these a reality in the classroom, without overburdening a teacher,” she adds. While such transformation in schooling at elite private institutions often comes at a cost, there are also organizations working toward levelling the playing field by using technology to address inequalities in the education sector. For instance, Zaya Learning Labs is a social enterprise that is changing the education landscape with their signature product – the Class Cloud – a wireless device loaded with educational content that can be accessed without an internet connection. With about 200 Class Cloud devices being used around the country, the organization has recently ventured the mobile way with the launch of their English Duniya application. “The app is a gamified way of learning English – whether it’s grammar skills, vocabulary, reading comprehension or listening skills,” explains Tulsi Parida, Director of Growth at Zaya Learning Labs. “English Duniya is available free on the Google PlayStore because we believe that education is a right that all children should have. It is currently for Grade 2 to 5 but we are adding more content in the coming months. Moreover, it will also soon be available in vernacular languages such as Marathi, Bengali, Tamil, Telugu, Kannada and Gujarati,” she adds. With countless other free apps aimed at enabling self-learning of this sort, it is easy to assume that education is moving toward being a largely individualized, independent, virtual experience. But experts agree that this is an unlikely outcome. “The teacher is in fact at the centre of the model we are adopting,” says Gorsi Parekh. “In the technology-enabled classroom, a teacher has to work collaboratively with children, provide one-on-one guidance in the learning process, and lead interdisciplinary endeavours that can help learners build connections between different subject areas. The teacher serves as the anchor that supports the child’s educational journey and enables him/her to develop their unique interests, passions and personalities,” she explains. “The relationship between a teacher and a child is really quite sacred and no piece of hardware or software can replace that,” adds Kevin Saldanha of Intellinects Ventures. “A human touch is needed to provide a nurturing environment for children, but this environment can definitely be augmented by technology. Teaching need no longer be pedantic wherein the teacher hands down information to students. Instead, technology allows for a more participatory method of learning wherein gaps in a student’s understanding can be identified early and the material being learned can be adjusted accordingly,” he says. Looking ahead, the steadily increasing availability of smart phones and internet connectivity opens up exciting prospects for reinventing education and making knowledge more accessible for every kind of learner. Moreover, immersive technologies capable of simulating experiences and bringing theoretical concepts to life are set to further transform the ways in which children learn. Technology is by no means a panacea, but it does offer invaluable opportunities to make teachers and school administrators more effective. By empowering human teaching talent rather than replacing it, the use of mobile applications in all kinds of classrooms may hold the key to addressing age old challenges faced in education. The author is a writer based in Ahmedabad. She can be reached at mehak016@gmail.com.